Virginia Tech student Morgan Harrington, 20, disappeared from a Metallica concert on October 17. (CNN) -- Police tentatively identified remains found on a remote farm as the Virginia Tech student who disappeared in October during a Metallica concert. Morgan Harrington, a 20-year-old education major, went to the concert at the University of Virginia's John Paul Jones Arena in Charlottesville, Virginia, on October 17. She was separated from her friends and was the subject of repeated searches. Police said skeletal remains were found after 9:30 a.m. Tuesday by a farmer driving a tractor through a hay field on his 700-acre farm. The area has no public access point, police said. The farm is about 10 miles from where the concert was being held. The farm's owner, David Dass, told CNN affiliate WTVR that he was out looking for damage after wind and rain knocked down several trees in his yard over the past week. He told WTVR that the area is at least a mile and a half from a main roadway. 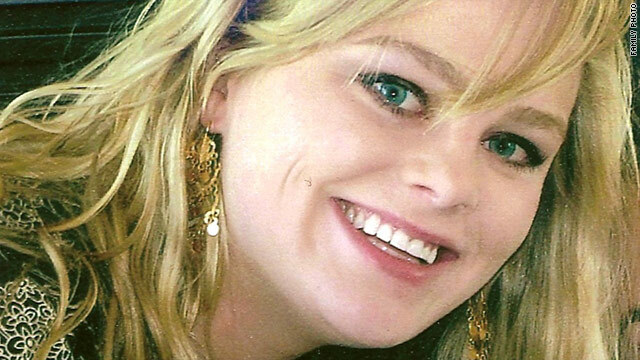 Video: Morgan Harrington's body found? "I looked down and saw what looked like a human skull, and my first thought was that it was Morgan Harrington," Dass told WTVR, adding that he immediately called 911. There was significant evidence leading police to believe that the remains are Harrington's, Virginia State Police Col. W. Steven Flaherty said, though he declined to specify what the evidence was. Police said the area where the remains were found had not been searched during the early stages of the investigation into her disappearance. The girl's parents, Dan and Gil Harrington, were in town to identify the remains, WTVR reported. Dan Harrington, in tears, told WTVR that "this is a horrible day" for his family. Gil Harrington expressed concerns Saturday that there was beginning to be complacency in the search, she wrote in a blog on the Web site set up to help find their daughter. On Sunday, more than three months after Morgan went missing, Gil Harrington still clung to hope. "Despite the length of time Morgan has been gone I remain hopeful," she wrote. "Part of me is waiting to be surprised. Waiting for God to pull the rabbit out of the hat and bring Morgan home. "I remember that the light always returns, it cannot help but return. Will the light of my life return soon? I cannot imagine that all the water of Morgan's potential is to run down the drain and be wasted. Can it really play out like that?" Now, it appears, the Harringtons finally have their answer. Police say they have now switched their focus to finding out how Morgan Harrington ended up in the remote farm and who put her there. During the concert, Harrington left her friends to use the restroom, police said. When she did not return, they called her cell phone at 8:48 p.m. She told them she was outside the arena and could not get back in because of its policy, police said, but told them not to worry about her and that she would find a ride home. There are restrooms inside the arena, police said, and police do not know how or why Harrington got outside. Witnesses who saw her outside the arena said she did not appear to be with anyone, police said. About 9:30 p.m. that night, witnesses reported seeing a person matching Harrington's description walking on a nearby bridge, police said. No further sightings were reported. Harrington's purse, with her identification and cell phone inside, was found the following day in an overflow parking lot near the arena, police said. A friend had driven Harrington's car to the concert, she said, and was still in possession of the car keys when they got separated. Harrington was reported missing the day after the concert, when she did not show up at her parents' home to study for a math exam with her father. Working with police and the Texas-based Laura Recovery Center, the Harringtons organized community searches, saying they would not give up hope that their daughter would be found. A $150,000 reward has been offered for information leading to Harrington's whereabouts, police said. Of that, Metallica contributed $50,000. The couple was joined at a news conference after her disappearance by Ed Smart, whose daughter Elizabeth was abducted in 2002. She returned home nine months later, after police say they found her in the custody of Brian David Mitchell and his wife, Wanda Barzee. Harrington said he reached out to Smart last week to seek advice on how to go through the disappearance of a child. Harrington was wearing a black Pantera T-shirt, a black miniskirt, black tights and black boots when last seen.